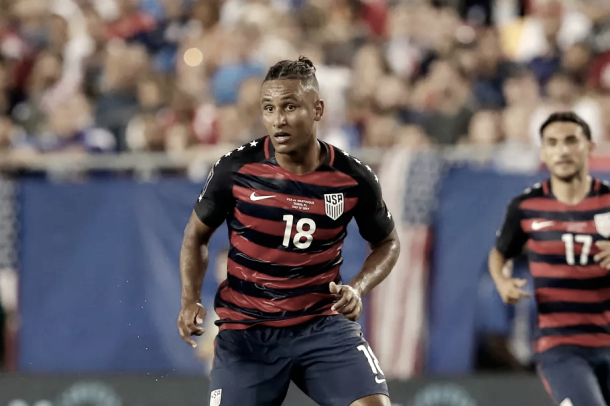 Part 1 of 2 on who should be the starting forward, and what should happen with Juan Agudelo? Trade? Super sub? Is it time to move on? Juan's minutes have been going down for a while now, going back to the Jay Heaps era. With Teal heating up late last year and early this year, Juan is running out of time to earn minutes. With Teal being 28 and Juan being 25, both have plenty of years left in them. For Juan, the hype train is starting to slow down. Juan has been hyped up since he became the youngest goalscorer in UMNT history at the age of 17, after that he hasn't done much. He re-joined the New England back in 2015 when he was 22, and everyone raved at how young he is. Now at 25, we're still waiting for that breakthrough season. For some time, Juan's time with the USMNT has been off and on. And every time it get's questioned more and more, especially in 2017. Juan, for the most part, was not starting and getting minimal minutes, but still found himself getting called up to the national team. And this year, it seems to be a curse for him, Kelyn Rowe, and Cody Cropper, who are all not starting. But it is the right choice in the case for Juan? Juan started to start the season off against the Philadelphia Union and didn't wow anyone. With that said, there was also 2 red cards in that game. following that, Teal got the nod and played a pretty unimpressive game against the Rapids, and wasn't much better against NYCFC. Considering that Juan was benched after one game, many were surprised to see Teal start a 3rd game in a row. Teal made an almost instant impact with his 15th-minute goal on the road to give the Revs their first road win on American soil in over 2 years. But in my opinion, I wasn't impressed with his play or the goal. The goal he scored was so basic it would have required skill to miss it. he didn't do much the rest of the night and he was subbed off in the 53rd minute. Teal scored another against a 10 man Montreal Impact, which was a lot prettier of a goal. When I judge if a goal is "pretty," the main thing I focus on is "if I put anyone else of that position in the scorer's place, could they also score in that situation." For most of Teal's goals, the answer is yes whereas Juan scores more skillful goals a lot more often than Teal. I think Juan, like Toni, got one chance and hasn't been given an opportunity to get back into the starting lineup. However, when Juan came on against NYCFC, in my opinion, he proved why he should start coming off the bench and almost immediately scoring a beauty in a game where teal was average at best. Juan should be given more opportunities, but at the end of the day, Teal is scoring goals, and that's what's important, and if it ain't broke, don't fix it.